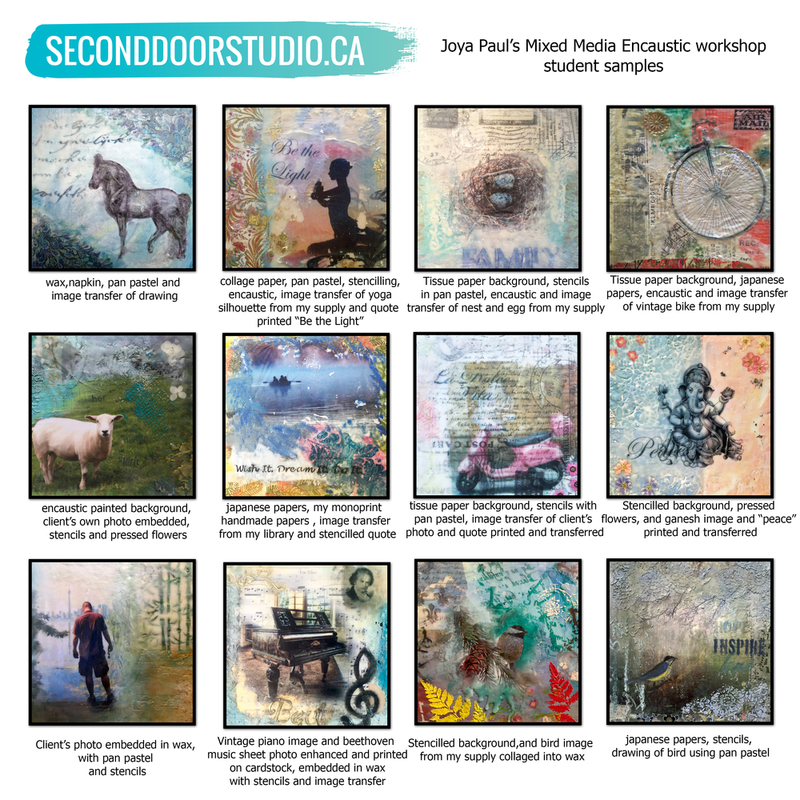 Art Mixed Media Encaustic Workshops to Inspire!!! You will be amazed at what you can create in this workshop! We will work with your own imagery or the collection of images I supply to create gorgeous and meaningful artwork that you can be proud to say you made. Encaustic is my main medium of choice...it is an ancient 3000 year old technique of painting in molten wax. In modern times, it has seen a resurgence due to the ease of heating up the wax...it has an etheral, dreamlike quality due to the translucency of the wax!. We will work with collage, image transfer, embedded objects, stencils and paint in a layered approach to create your unique piece of art. You don't need any art experience as I will guide you all the way from start to finish in creating your 10" x 10" finished artwork. If you are an artist, that's great too...you will learn new skills in this exciting medium. I have been teaching encaustic workshops for 8 years and love helping people be inspired, learn and create art. This is NOT just an art class....it's an experience, and I believe an enriching one which will feed your soul and ignite your passion. We all have a creative spark within us. We will light your life together with art. Here is just a sample of the beautiful artwork created by past students....I feel like a proud parent. No art experience is necessary, just be open to the power of your own inner voice and I will teach you new skills to unleash your creative vision. The price is $90 per workshop which takes place on the weekend. This price includes tax, all supplies, including printing and cropping your own photo (if that is what you choose) and a 10" x 10" wood panel. The workshop is 3 hours to be able to finish a piece from start to finish, but if extra time is needed, we will take it! I want you to leave happy and inspired. My studio is located at the historic Distillery District in the Artscape Building (Studio 103) and is itself a source of inspiration. I keep workshops to a maximum of 6 to ensure you have enough personal time with me and we will work on your piece until you are finished. It is first come first served so please book ahead of time to ensure you get your picture cropped and printed. In the event of a snowstorm, we will reschedule if road conditions are too hazardous. Please note that due to high power equipment and tools used (hot plate, heat gun), I do not teach children under 12 unless supervised by an adult that is also taking the class. Thanks for understanding! Please contact me at joyapaul@icloud.com if you have any questions or want to arrange a direct payment to book your spot in the class. If you want to book a nightime event with a minimum of 3 people, please contact me directly. For other workshop and art experiences, click here. Sign up with your email address to receive updates and promotions for upcoming workshops. Almost done! Check your email to confirm your email address.